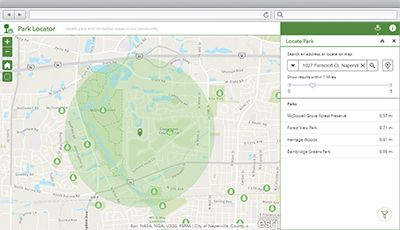 Park Locator is a configuration of Web AppBuilder for ArcGIS that can be used by the general public to locate a park or recreation facility and obtain information about recreation activities in their community. Park Locator is typically used by parks departments, planning departments, or other local government agencies responsible for promoting recreation activities. It provides access to the organization 24 hours a day, seven days a week, and typically supplements customer service phone numbers staffed by government organizations. To deploy Park Locator with the ArcGIS Solutions Deployment Tool requires specific software. Application Park Locator An application used by the general public to locate a park or recreation facility and obtain information about recreation activities in their community. Map Park Locator A map used in the Park Locator application to locate a park or recreation facility and obtain information about recreation activities in their community. Feature layers ParkRecreationFacilities A feature layer used to store natural spaces set aside for recreation or the protection of wildlife or natural habitats. ParkRecreationFacilities_public A public feature layer view used to share natural spaces set aside for recreation or the protection of wildlife or natural habitats. Below are the release dates and notes for Park Locator. A new Web AppBuilder for ArcGIS application configuration. Improved ParkRecreationFacilities_public feature layer view using Arcade expressions. Revised ParkRecreationFacilities feature layer schema. First release of Park Locator application using Web AppBuilder for ArcGIS.